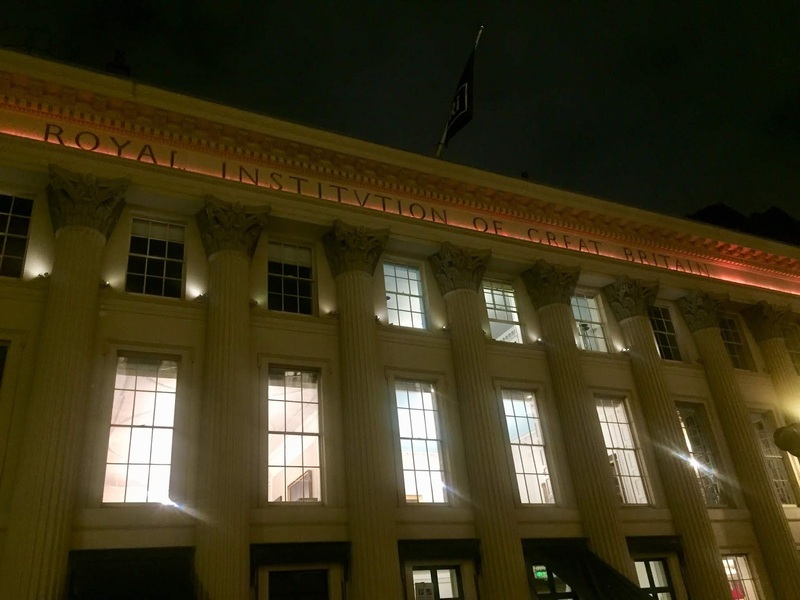 Today's first was VERY brainy of me: I went to a talk at the Royal Institution of Great Britain on 'Mental Health in a Digital Age.' I went with Nat and Nigel, who are of COURSE members and science nerds. This membership is the exact opposite of my own at the British Library. While they attend lectures with names like 'Why Space Itself is Quantum in Nature', I go to exhibits involving cats in books. Tonight, though, we are all equally excited by the topic. We are ready to find out from leading experts in mental health and technology about how toxic our screentime is. Science Lives Here, according to their motto. Speaker 2 takes the stage, the Chief Technology Officer from the Wellcome Trust. He launches into their own research on how Data is Key to diagnosing and recovery with mental health issues. This is when we realise: this is a talk on Mental HeathCARE in a Digital Age. The Ri has click-baited us! Speaker 3 - our collective favourite - lives in Vienna and covered the economic cost of mental heathcare in Europe. I just made that sound awful. But it wasn't - she had this slideshow with some mental health tests, as an example of stuff they're rolling out in Austria right now, and it was fascinating. While not what we expected, it was still an interesting night. They had some wild stats about mental health - apparently 1 in 6 people in Europe have a mental health disorder (Speaker 1 threw out a 40% number for the UK) - and it costs the EU like a zillion dollars a year in care and loss of productivity. I wonder if they've thought to drop everyone into bodies of cold water? A second first happened on the way home: I accepted candy from a taxi driver! A packet of Haribo Starmix, which I've never had before. Two firsts! Who knew I could've skipped the lecture entirely and just jumped in the right Uber for today's content? The night was a success all around. Now if you'll excuse me, I have a phone screen to get back to.